no, they just have all the bases covered. Recently there was the release of yet another game changing mountain bike the Bronson 27.5" which shoe horns itself into their range It's liable to become the holy grail of the world enduro circuit and may become the choice for riders coming from downhill and 26" wheels to enduro racing. 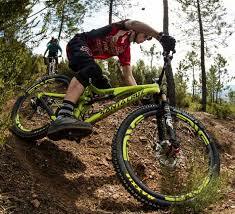 Some enduro riders use Tallboy LT 29ers which are also good if you want to do cross country, now there's a choice. Cutting edge is what Santa Cruz do and they do it well, they have always created bikes that cover many different types of riding, copied in various degrees of success but never bettered. Iconic bikes that have been part of the evolution of MTB's have been tweeked with the introduction of new technology, Old favourites like the Superlight have evolved this way and now has the choice of 26" or 29er, this ethic is adopted across the range to keeping die hard fans happy and interested, Santa Cruz listen to their customer base and know what they want. Carbon fibre has been a massive weapon in the Santa Cruz armoury, like everything else they do it well and it adds to the choices they provide, they are at the higher end of price and quality but it is easily apparent why, beauty in form and function usually come with a higher price tag. Alloy framed bikes are offered to give a price point option with a small weight penalty. Santa Cruz create Benchmark bikes that allow riders to improve their skills, their bikes read like a roll of honor in mtb history, if you have ridden one you will remember how it helped you move forward. From the original single pivot bikes to vpp system, the adaptable chameleon, all rounder the nomad, fantastic 4X blur, world champion V10, ballistic carbon blur, ground breaking Tallboy, ultra fast Highball, unbelievable Tallboy Lt and now the new boy, the Bronson 27.5. All of them game changers in their own way but with one goal, making some of the fastest riders on the planet and mere mortals go faster without compromise, no longer the older I get the faster I was, but now the older I get the faster I am. So what bike would you choose, If you could only have one bike what would it be? Identify the type of riding you do and get a bike that suits your style of riding. If your lucky you may have more than one bike, if that's the case bikes that complement each other from opposite ends of the spectrum like a Nomad and an xc Blur work well together, one for it's hard hitting ability and the other for pure speed and agility. There now exists a sliding scale of SC bikes some of which suit a myriad of purposes and cross over well, the Bronson fits that brief perfectly. If you can't afford the new Santa Cruz you would like, consider buying a pre-loved one, get on the ladder and you won't look back, alternative brands loose a high percentage as you roll them out of the shop. Spend less money on a pre-loved Santa Cruz and if you buy it right you will re-coupe your outlay when you move on to your next one, consider it as an investment not only in a bike but in yourself getting the best value from your time on a bike. Ex Demo bikes are good value and are always well kept, they are as good as a new one would be after your first few rides out, and you will always find a queue of takers when it comes to part company with your old Cruz for another one, it's a no brainer, trade up. There has never been a better time to get a Santa Cruz that fits many needs, the Bronson 27.5" looks like it caters for a wide spectrum of mountain bikers, combine that with the reintroduction of the Rock Shox Pike with quick adjust travel and the enduro and all mountain scene looks set to be blown wide open. The queue's is getting long to ride the Bronson and even longer to own one. Be quick to get in line.